Tired of letting stress have a negative impact on your life? Easy. It's impossible to get through life without encountering stress. And unfortunately, most of us learn the incorrect ways to cope with it. Thankfully, Stress Management For Dummies gives you trusted, time-tested guidance on teaching your body and mind to properly cope with stress while keeping your sanity intact. Whether it's love, work, family, or something else that has you in the red zone, this updated edition of Stress Management For Dummies will help you identify the stress triggers in your life and cut them down to size — all without losing your cool. 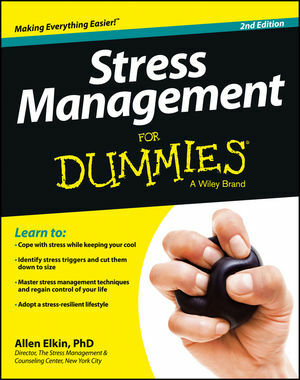 If you want to manage stress and get back to living a normal life, Stress Management For Dummies has you covered. Allen Elkin, PhD, is a clinical psychologist and the director of The Stress Management & Counseling Center in New York City. Nationally known for his expertise in the field of stress and emotional disorders, he has appeared frequently on Today, Good Morning America, and Good Day New York. Click the "Click to Download" link to listen to the audio files. To download the files, right-click the link and then choose "Save Target As" or "Save Link As" depending upon the browser you are using.